1907. 1907 Compilation of Latin American Commercial and Maritime Laws Walton, Clifford Stevens. Leyes Comerciales Y Maritimas de la America Latina: Comparadas Entre si y Con Los Codigos de Espana y las Leyes de Los Estados Unidos de America. Profusamente Anotados con la Legislacion de Espana y Con la Jurisprudencia Extranjera. Washington: Imprenta del Gobierno, 1907. 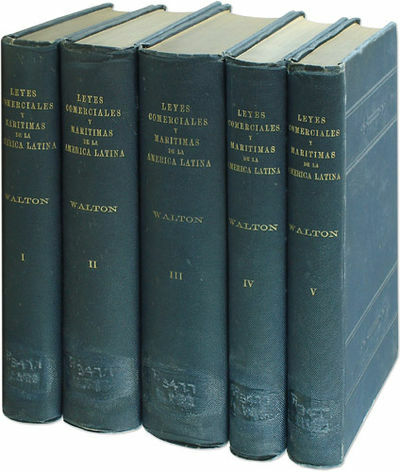 Five volumes. Complete set. Original cloth, moderate shelfwear, internally clean. Ex-library. Shelf label residue to spines, bookplates to front pastedowns, stamps to front free endpaper, perforated stamps to title pages. A very good set. $300. * Stevens, an American jurist and legal historian, was an expert on the legal systems of Spain and Latin America.